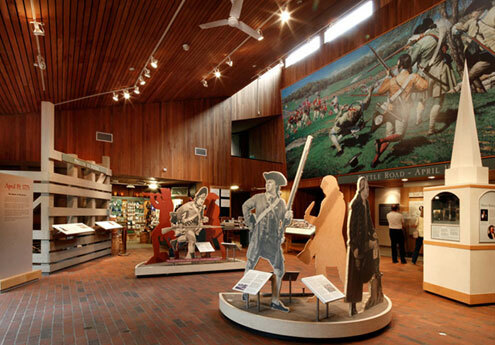 Minute Man National Historical Park « Jeff Kennedy Associates, Inc.
Every American school child hears about the midnight ride of Paul Revere and “the shot heard round the world.” We developed a one-of-a-kind way to tell the story of the unforgettable events that began the Revolutionary War and gives visitors to the Battle Road site a new way of looking at the way time and geography can shape history. Originally conceived by the National Park Service as a static exhibition, we were convinced that an innovative media-based approach could best convey the richness and complexity of the way events really unfolded over those two world-changing days, April 18–19, 1775. 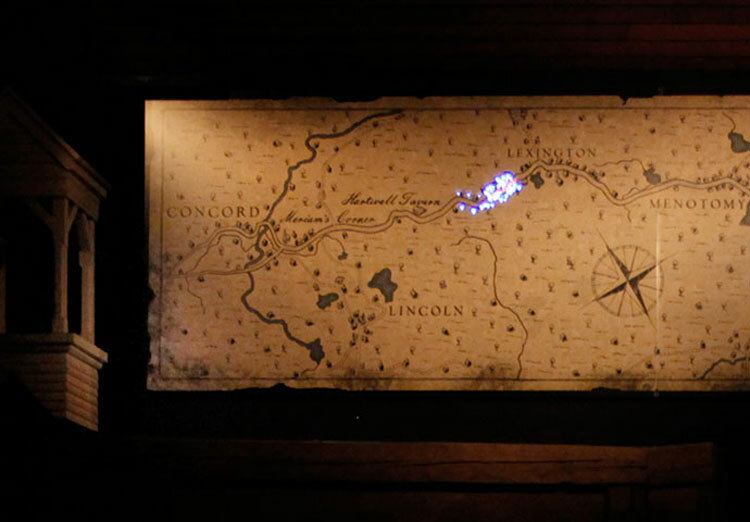 The theater is designed to reflect the geography of the battle, with Boston depicted on the right, and the countryside where the battle began on the left. Special effects, surround sound and keyed lighting are programmed to move viewers’ attention around the theater throughout the show. The theater seats approximately 60 people, and the show runs for 25 minutes. 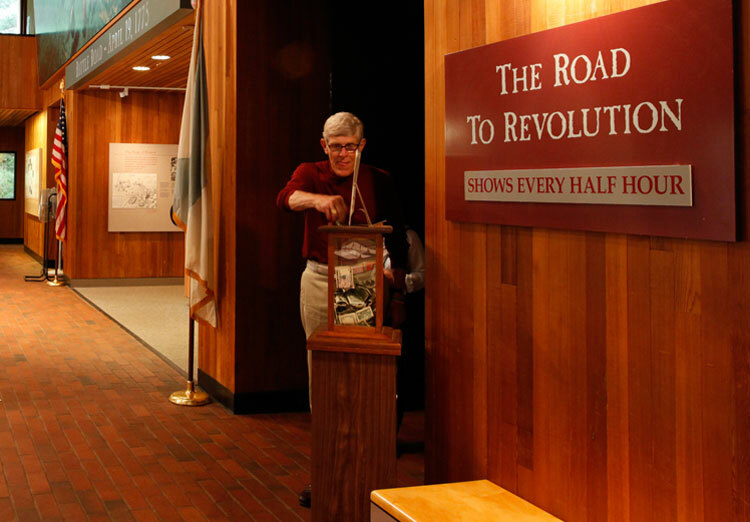 Amos Doolittle, the young Connecticut engraver whose drawings of the battle were published in American newspapers, serves as our first-person narrator. 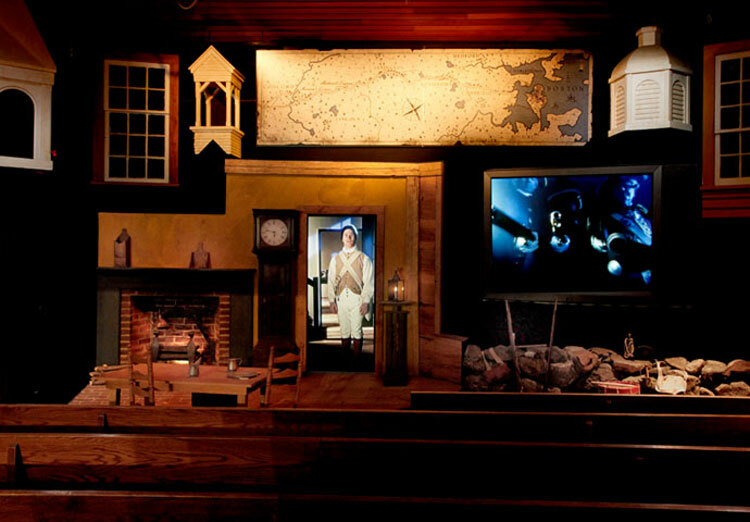 In the Hartwell Tavern part of the stage (left), Doolittle, projected as a life-sized image, converses with unseen characters seated at the table. We developed the first draft script and storyboard for the show, which was then artfully produced by Northern Light Productions. Central to the “Road to Revolution” set is a period map that animates to follow the path taken by British troops from their arrival in Boston harbor to their encounters with the Minute Men along the historic Battle Road in Lexington and Concord. 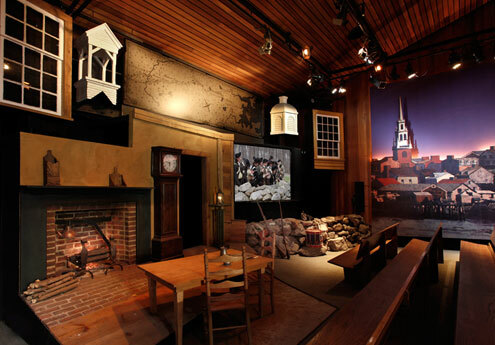 An immersive set combining models, artifacts and projected reenactments of Paul Revere’s ride and battle skirmishes (right) makes audiences feel as if they are part of the story themselves. This set features a stone wall lined with British rifles, ammunition and a drum. 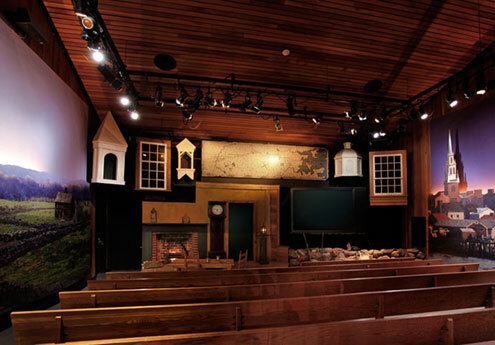 After more than a decade of extremely high visitation and audience satisfaction, this unique audiovisual presentation is still extremely popular. In addition to developing “Road to Revolution,” we designed an exhibition for the visitor center that tells the story of April 19, 1775 in abbreviated form. Like the multimedia show, the design approach features authentic, historic personalities as opposed to generic Minute Men or British Regulars.